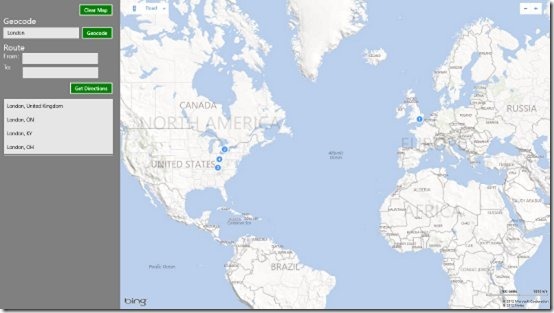 In this blog post we are going to look at how implement Geocoding and Routing using the Native Bing Maps Windows Store App SDK. 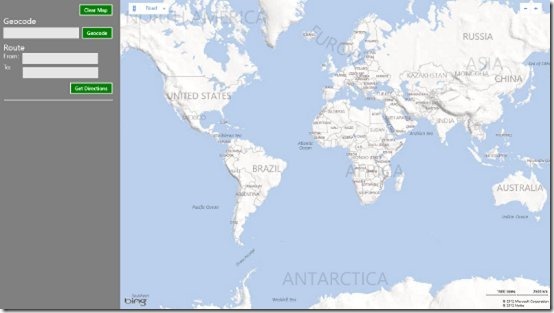 If you are new to developing with the Native Bing Maps Windows Store App SDK I recommend reading the Getting started with Bing Maps Windows Store Apps blog post first. 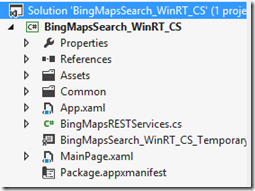 We will also be making use of the Bing Maps REST Services, if you are unfamiliar with using this in native code take a look at this MSDN documentation on Using the REST services with .NET. The methods covered in this blog post can be used as an example of how to access other REST services from Windows Store applications. Geocoding is one of the most common tasks by users of online maps. 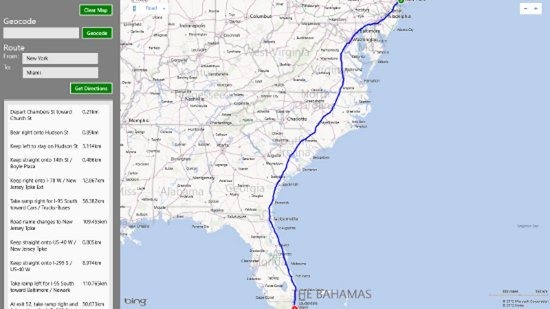 Geocoding is the process of taking an address or query and returning its equivalent coordinate on the map. 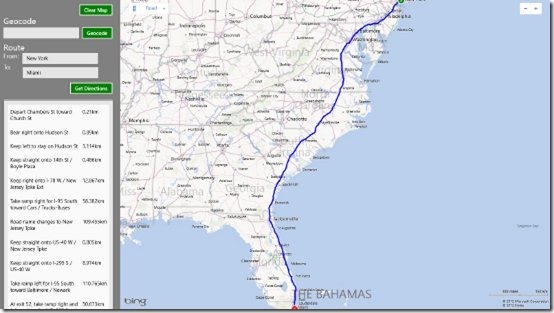 Routing is the task of calculating the directions between two or more locations. In Bing Maps, there are a lot of different options around routing such as routing by different modes of transportation; driving, walking, or transit. To set up the project, open Visual Studios 2012 and create a new project. In the window that opens, select Visual C# -> Windows Store. 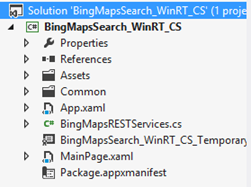 Select the Blank App template and call the application BingMapsSearch_WinRT_CS and press OK.
To get started we will need to add a reference to the Bing Maps SDK. To do this, right click on the References folder and press Add Reference. 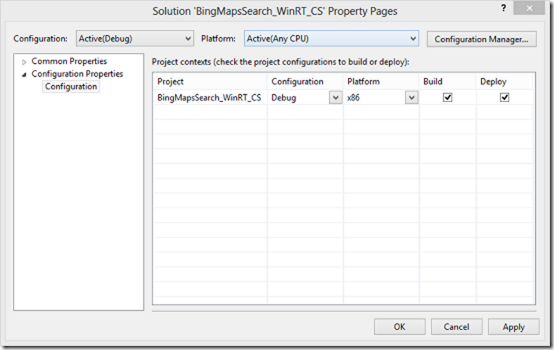 Select Windows -> Extensions select Bing Maps for C#, C++ and Visual Basic. If you do not see this option, take a moment to verify that you have installed the Bing Maps SDK for Windows 8 style apps. While you are here, you should add a reference to the Microsoft Visual C++ Runtime Package as it is required by the Bing Maps SDK when developing using C# or Visual Basic. You may notice that there is a little yellow indicator on the references that you just added. This is because the Bing Maps SDK requires that you set the Active solution platform in Visual Studio to one of the following options. To do this, right click on the Solution folder and select Properties. Then go to Configuration Properties -> Configuration. Find your project and under the Platform column set the target platform. For this blog post I’m going to select x86. Press Ok and the yellow indicator should disappear from our references.